Here you see the implementi of torture. Yes my yellow yoga mat is filthy. Never mind. What's important are the tools at hand to be working on these really grumpy muscles all around my hips, especially the right one. 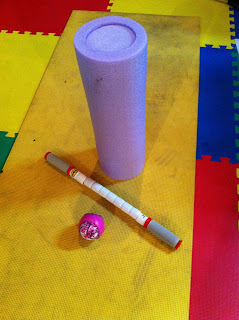 The Stick is good for muscles where you can really lean into it and roll back and forth. Having someone else use it on you where you can't get the leverage is good. The foam roller is a more general roll. The ball gets right into the specific deep areas. I like to lie down on it, and move around a little bit. It's also really good for rolling the fascia of your feet on. No, I still don't know what I did to it. The Robaxisal didn't do much but now that things are starting to relax I might try it again just to see. Maybe it will help the neck and shoulder muscles that are grumpy too. There was one very tender spot I found with the ball that made me whimper, just a little. I found some menthol cream that I've used on my feet lots, and have rubbed it into the small of my back, and all around my hips. The smell is making my eyes water in a good way. The tingle is just starting. ooooohbhhh!!! Lots of stretching, trying to breath into the sore spots, as my yoga instructor would say. Which we are now done with for the summer. I will miss it. There are lots of times where the last thing in the world I want to do is drag myself back out of the house, and every time, I come home glad I went. 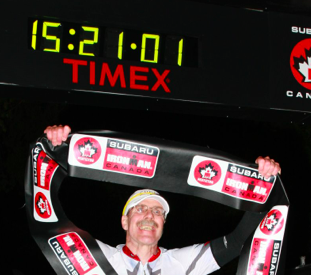 Calgary 70.3 is getting a little more real now. 11 days to go. I had been hoping for some really good workouts between Chinook and 70.3, and those haven't happened. That would be fine since I think I've still got some good base fitness, but I have to admit I'm worried about my grumpy muscles. I am in no condition to be doing a half IM right now, but I'm hoping the rolling, stretching, and the accupuncture appointment will bring things around. Hope you feel better soon. I find ART treatment and massage super helpful for my cranky muscles. However, the most effective so far has been intramuscular stim with an acupuncture needle to release the tight muscle. I was skeptical about this treatment, but it cured me! I love the accupuncture, especially with the shocking machine, works really well for me. Unfortunately, I couldn't get an appointment till early next week. ART was really good for my knee. I am still sad that my wonderful massage therapist is down east for the summer. I may have to try some other therapists.